Folks, one of my fondest childhood food memories is when my Mommy used to whip up this Prawn Chilly Fry with Coriander Speckled Rice for us. I ♥ prawns in any form and in the days to come, I will share a few more of my prawn recipes with you. I have wanted to try making this dish forever, but did not get around to it till a couple of days ago. I picked up some gorgeous, fresh prawns and I knew that I just had to finally whip this up. There was just one little problem, I didn't have my mother's recipe and my parents were on holiday and I really didn't want to bother her by calling. So I decided to put it together from memory, trying really hard to remember what the flavors were like. And boy,oh boy! I was thrilled with the result. This meal is going to make many more appearances in my home, for sure. Heat the ghee in a vessel and add the whole spices. When the ghee had released the aroma of the spices, add the washed rice. Stir gently just until the rice is coated with the ghee. Add 2 cups of water, salt to taste and stir a little. Make sure you don't stir it too much as the grains of rice will breakdown. Cover and bring to a boil on medium heat. On low heat cook till all the water has been absorbed. Make sure you don't stir the rice during the cooking process. Once all the water has been absorbed, use a fork and loosen the grains of rice and make sure that all the water has evaporated. Keep covered. Marinade the prawns with a little salt and a dash of lime juice and keep aside. Add the curry leaves and when they release their flavor, add the onions and green chilly. Saute till the onions are light golden brown. Add the turmeric powder and chilly powder. Stir well. Once its mixed well, add the tomato and stir well. When the ingredients in the pan have been sauteed well and you see the oil starting to separate, add the prawns and cook on medium heat. Still well and cook uncovered till the prawns are done. Sprinkle the chopped coriander leaves and stir till combined. Layer about half the rice on the serving platter on in individual plates. Spoon the prawn chilly fry over it. Add another layer of the remaining rice. Sprinkle generously with the chopped coriander leaves. 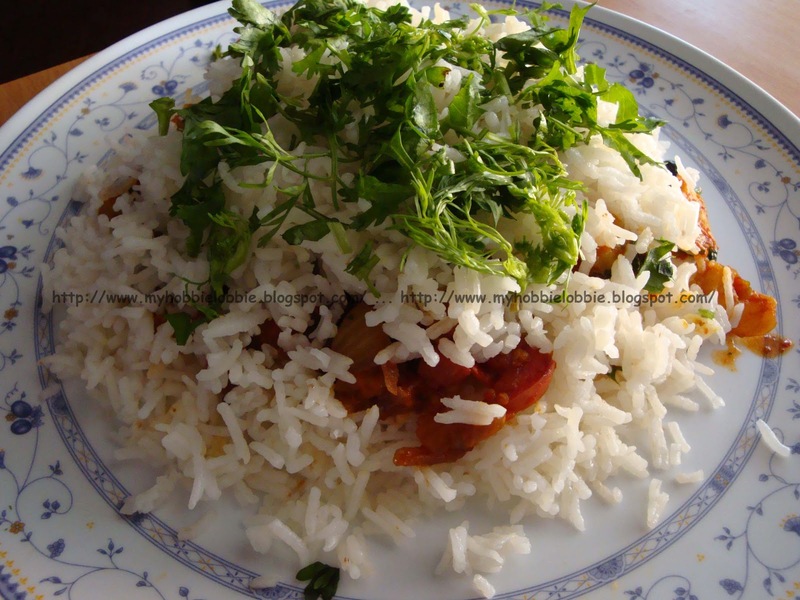 Don't be shy while topping the rice with coriander leaves. Its a generous sprinkling of the coriander leaves that brings the elements of this dish together and makes it one finger-licking meal. Oh Trisha - I LOVE prawns. This is the perfect luncheon salad. Thanks for sharing! I could REALLY go for a big ol' plate of this right now! It looks awesome.